I wasn’t going to do a post today as I don’t have a whole lot of time to devote to my blog lately with packing underway for the big move, but I threw a Mexican meal together last night and posted a photo on Facebook and someone asked for the recipe so here it is. If I had known I was going to be doing a post about it, I would have staged the plate a little better. 2. Slice 2 rings of red onion and half a green pepper into thin strips; saute slowly in a tablespoon of Olive Oil until caramelized then remove to a bowl and set aside to cool. 3. Shred 1/4 cup Monterey Jack Cheese; divide in half. Assemble enchiladas by placing the cheese first in the middle of a tortilla, followed by half of the onion/pepper mixture. Top with the beef and roll up tightly and place seam side down in prepared pan. Top with a couple more spoonfuls of the salsa, cover and bake at 350°F for 30 minutes. 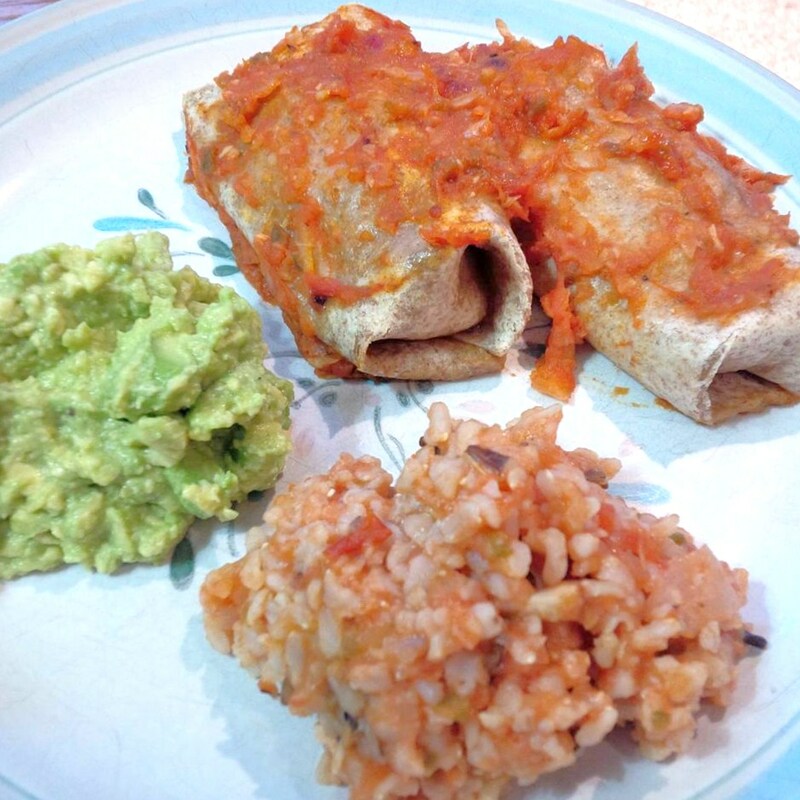 See recipe here for the Mexican Red Rice and Roasted Salsa Roja. For the guacamole: Mash 2 avocados with fresh lime juice, ground black pepper, salt and a tbsp of chopped fresh cilantro. The enchilada filling is enough for only one person, you will have to increase accordingly for more servings. * I roasted a whole beef rump roast in the slow cooker for 12 hours on the weekend and then shredded it. I usually get 3-4 meals of BBQ Beef Sammies but there was a little leftover, therefore having enough to make the enchiladas. What is the craziest thing you have ever done for a favourite restaurant dish? Me? 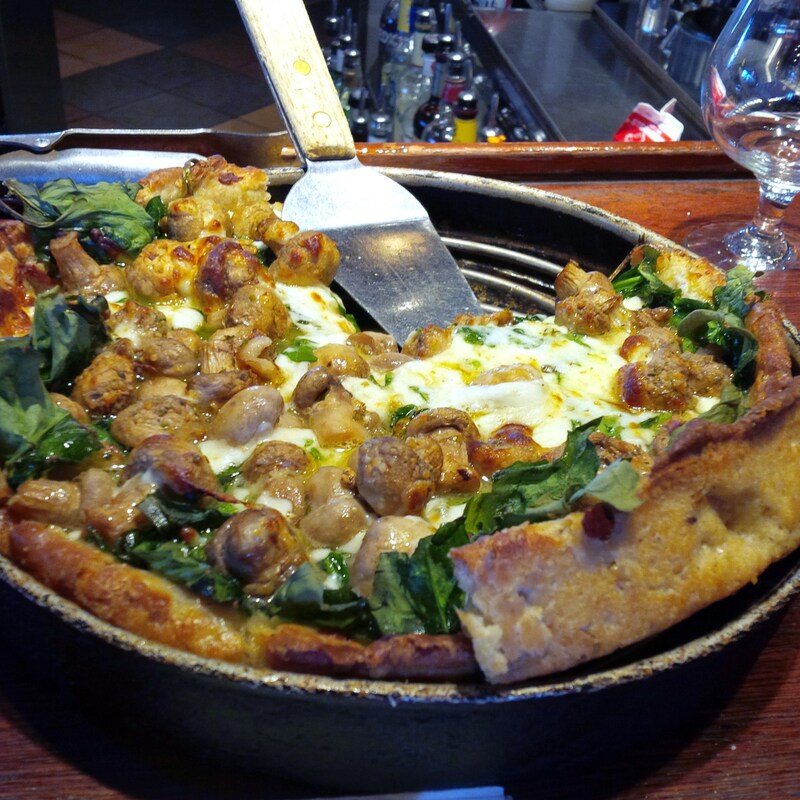 I just drove 300 km one way for a pizza…and not just any pizza, but Uno’s Chicago Grill’s famous ‘Shroom Deep Dish Pizza. 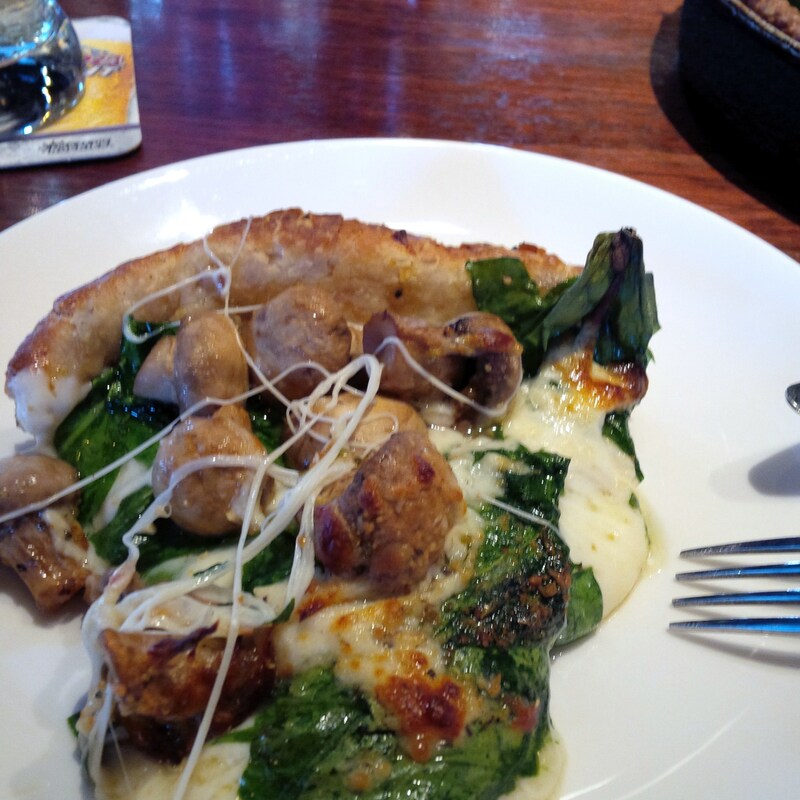 This pizza is the BEST pizza I have ever eaten, and if you love mushrooms, then you will LOVE the ‘Shroom Pizza. You see, several years ago, they took it off their menu and I was devastated. I even emailed the company at the time to pitch a fit and it didn’t help. Then, a few weeks ago, hubby told me that they were bringing the ‘Shroom pizza back. You see, hubby has been working in NY State on a temp job assignment for a number of years and the hotel where he stays at is a stones throw from an Uno’s restaurant. He is typically there one evening a week for dinner and has gotten to know the staff quite well over the years. The barkeep let him know that they were bringing the ‘Shroom pizza back which he then passed along to me which was the most wonderful news I have ever heard. So it was just a matter of counting down the days to March 18th, the day it was being re-launched in their restaurants. I had been planning on heading down to NY by the end of the month, but on the morning of the 18th, hubby reminded me that that was day it was coming back. I quickly looked at my business schedule for the day and seeing nothing pressing, emailed him back that I was getting myself together and I would be on the road by 11 a.m. I quickly packed an overnight bag, tossed my laptop into its travel case and headed out the door. WooHoo! I was so excited! Border Guard: Where are you going? Border Guard: What’s in Webster? Me: Uno’s Chicago Grill is bringing back their ‘Shroom Pizza on their menu and today is the first day it is available. Border Guard: ?? “OK..have a nice day ma’am” and he sent me on my way. In a span of 30 seconds I was cleared to enter the U.S. and then spent the next 2 hours driving through farm country along the southern shore of Lake Ontario in bright sunshine dreaming (and drooling) of what was to become dinner. At hubby’s hotel in the afternoon, I impatiently waited for him to come back from work and after a quick peck on the cheek followed by a happy hour cerveza, we headed over to Uno’s. The barkeep (Jess) brought us our drinks and asked if we wanted menu’s. I told her I didn’t need one as I already knew what I wanted and told her I just drove from Ontario to have the prized pan of yummy goodness, I even told her the border guard story, much to her delight. After about 20 minutes, my much anticipated pizza arrived to loud fanfare (I think I even heard angels singing and rockets bursting)….oh wait, that was me squealing…. The ‘Shroom Pizza as you have probably guessed by now, is chock full of sauteéd baby button mushrooms (which seem to be cooked with some herbs, thyme maybe, and some white wine as the flavour of the sauteed mushrooms are sincerely awesome on their own) and if I calculated accurately, about 10lbs of mozz cheese. Oh, but there is also spinach in there, so that most definitely makes it healthy for sure, along with the 9 grain deep dish crust. Topped with a sprinkling of Parmesan cheese, this is hands down, my most favourite restaurant dish EVER. I could eat this every day of the week, mind you, my arteries surely couldn’t handle all the cheese, nor my waistline. But I would die happy. Trying to get a good photo with my Blackberry camera was challenging, especially when all I wanted to do was dive into the plate. This is a 12″ pizza, and I managed to scarf down 3 pieces before my stomach screamed Uncle. Good news though, there were 3 pieces leftover for the next day. We joked with the Jess the barkeep about crossing the border back into Canada with the leftovers. Hubby said “what if they don’t let you back in with that? You know you are not supposed to bring cheese back across the border?” “Fine” I said “then I will stand there and eat it as there is no way in hell they are going to confiscate my leftover ‘Shroom pizza!”. We toddled back to the hotel room, leftovers firmly gripped in one hand to be stored in the fridge overnight. The next morning, after packing up my things and heading out, I indeed wondered what the Canadian Border Guards would say about my one day folly for a pizza. I arrived at the border crossing about 11:30 a.m. and pulled up to an empty booth (amazingly, I thought with March Break under way it would have been more hectic) occupied by a female Border Guard. I handed her my passport as she asked where I lived. Burlington I said. Border Guard: Where did you go? Border Guard: Why?, what’s in Webster, NY? Me: My husband and ‘Shroom Pizza. Have you heard of the Uno’s Chicago Grill restaurant chain? Border Guard: So you went all that way for a pizza? “So sorry honey, I came for the pizza, not to see you” she quipped. She asked a couple more standard questions, then giggled as she handed my passport back to me and said have a great day and hope you enjoyed the pizza. Oh you bet I said! So 24 hours, 600 km and almost a tank of gas later equals one expensive pizza….but so well worth it!!! Do You Hear Crickets Chirping? It has been a crazy few months around the Southern Homestead. So much to do in so little time that I have neglected one of the things I love to do most….write my daily adventures. Hence the title of this post…the long time sound often used to denote nobody or nothing is around or listening. I spent almost every waking moment from January until 2 weeks ago purging, cleaning, primping and staging our home for sale. I sewed new throw pillow covers for pretty much every room in the house (14 in all! ), there was touchup painting and cleaning and washing the insides of cabinetry, then set finishing touches in every room. I even cleaned windows, inside and out, in subzero temps. As a Realtor, I know the importance of maximizing your homes potential for a quick sale. All that hard work paid off as we listed and sold within a week for over our asking price. Then, just 5 days later, we bought a condo apartment. Another whirlwind of emotions with the end result being we have the next chapter in our life to look forward to. More on that in a later post though. In between all the house staging/selling hoopla, I managed to finally somewhat master the spinning wheel I borrowed from my Aunt and Uncle last summer. Once I figured out that moving parts were gummed up and employing help from hubby to rectify them, I was off to the races. 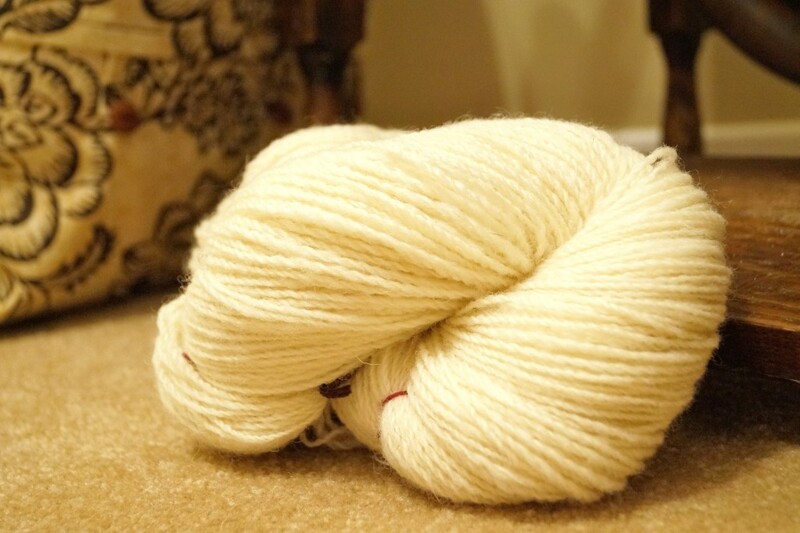 As when I learned to spin on the drop spindle last Summer, the first output of so-called yarn was laughable at best. So I sat for about an hour a day, usually evenings or early mornings, spinning from roving (prepared wool) that was on the rough and scratchy side (practice fluff) and I now have a skein of yarn that can actually be made into something without falling apart. 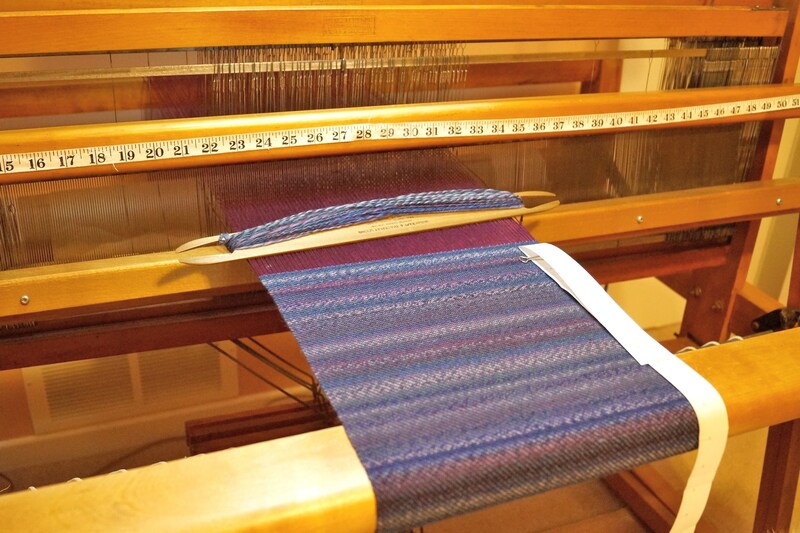 Bob the loom is still set up with a project as well. A scarf that I am weaving with some handspun yarn created last Fall on my drop spindle, of which it is about half done. I need to get that finished up and off the loom before the loom gets taken apart for the big move. Packing has also commenced, along with more purging of *stuff* in the crawlspace. I tossed an awful lot of things into that deep canyon while prepping the house for sale. A crawlspace is great place to store things, but it is so huge, that before you know it, it is filled to the brim with things that you no longer use or need but don’t have the time to get rid of. Time to knuckle down now though if I want to be out of here in 60 days. So my living room is set up with empty boxes and there is a staging area in the crawlspace for garage sale items, which is probably at least half the stuff in there if not more. The rest will be donated or recycled in some fashion. I detest sending anything to the landfill unless it is broken and of no use to someone else. 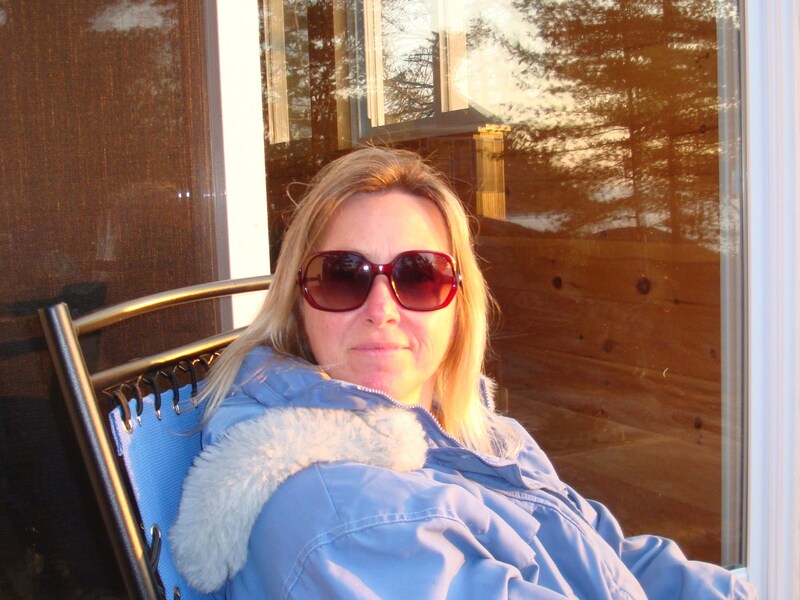 Hubby and I are very environmentally conscience which comes from years of cottage life experience as well as our own morals of what we want for the planet. Hence my gardening/self-sustaining practices. Of which, TODAY is the day I finally start my seed planting for the garden. I was delayed a week or two by the house selling routine. 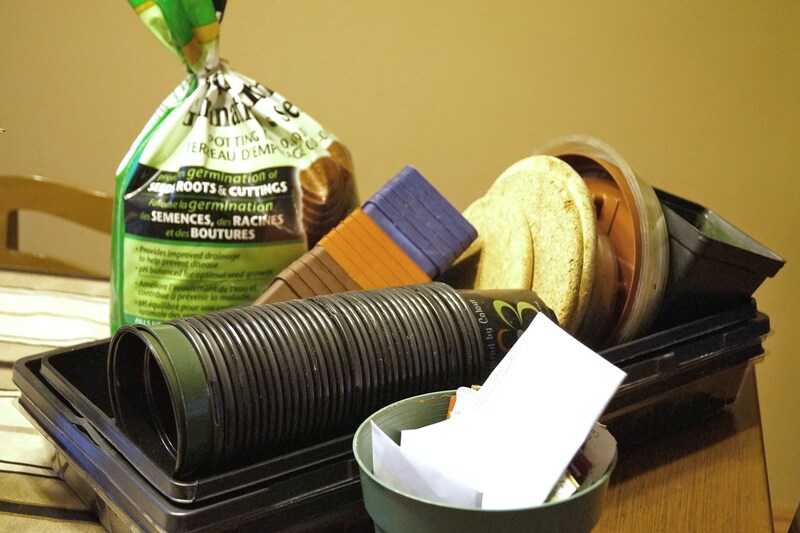 I couldn’t very well have a living room window full of seed starting trays and pots, people would think it was a greenhouse, not a living room. Cooking has also of taken a back seat lately, I cook to feed ourselves, but haven’t had time to experiment with anything new and exciting, which is a bummer as that is something I really like to do. Once the move is done and we are settled into the new digs, then I will get my creative chef’s hat back on. So that is about it in a nutshell, the important things anyway. I will post quick updates as we move along with the move, but I hope for a return to a normal routine come June. Just in time for all things blooming and growing in the gardens and the peacefulness of summer at the Northern Homestead.